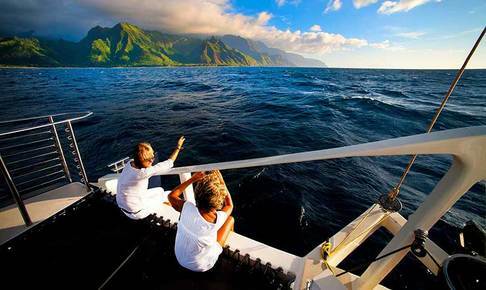 This Na Pali Sailing tour is a premier "dinner with a view" experience. I love to watch the sunset behind the forbidden island of Ni'ihua with full rainbows stretched across the mountains as the clouds change colors like a kaleidoscope. Sunsets at sea, viewed from your luxury yaht are spectacular. You will marvel at the panoramic view of the entire Na Pali coastline from Haena to Milolii while your scrumptious meal is prepared fresh in the ship's on-board galley. Sip cocktails as you watch the light react with the clouds and unique cliffs of the coastline. This is a tour to punctuate your trip with a evening of stellar views and food. Includes: Passengers will enjoy this vessel almost as much as the views outside of your fully custom 65-foot luxury sailing catamaran that is simply the premier ship of the Na Pali Coast. Your meal is stricktly first-class (see menu below). I suggest wearing layers including a jacket for evening temperatures on the water. There is no snorkeling on this trip. Sorry but no third trimester pregnancies are allowed. No children under 2 years old. Passengers must be able to manage stairs.